Close to everything! Minutes to grocery stores, gas stations, hiking trails, frisbee golf course and other amenities. The main level has 2 masters (both with large closets and private baths), 3rd bed and bath, along with the living room, kitchen and dining room. There is a gas stove and private deck off the main master. Go Â½ way downstairs to a sunroom leading to the lower level that has a very large 4th bed (does not have a closet), bath and 2nd family room. 4 fireplaces give a cozy feel throughout, not to mention decreased heating costs. 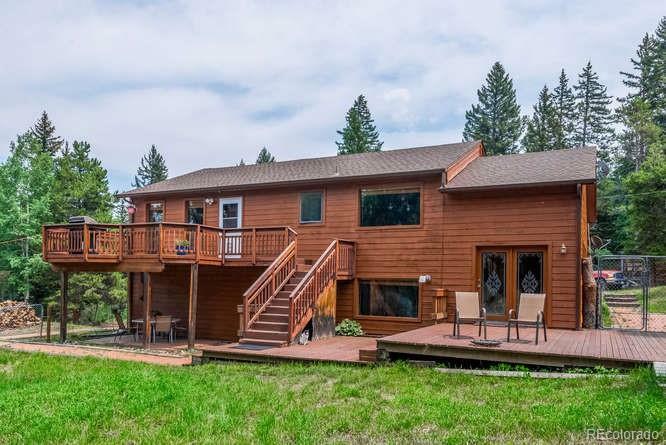 Multiple patios and decks for enjoying this beautiful, flat lot w/ aspen, variety of conifers and lots of privacy. The oversized 2-car garage has a workbench. There is flat space for an RV. Short commute to Denver, gold-medal fishing and world-class skiing!